The first semester of 2010 will be special to MMA. In February and April, two fighters will put the name Gracie back to the UFC, event built by the most important family on MMA. 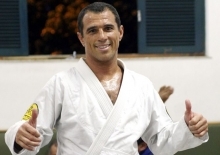 Talking to TATAME.com, Royler showed excitement to the debut of Rolles (UFC 109) and Renzo (UFC 111). “I think Renzo has everything beat Matt Hughes“, guarantees the four times BJJ world champion, who talked about the controversy black belt gave to Rashad Evans on the quick chat that you see below. What did you think about Renzo’s decision to debut in the UFC at age of 43? Renzo is Jiu-Jitsu’s emperor, even the enemies like him. He’s spectacular, always laughing to everyone and I know he’s training hard. It’s a tough fight and he knows that, but if I had to bet, I’d bet on Renzo. I think he has everything to beat Matt Hughes. You helped Royce on the preparation for the fight against Matt Hugues… Did you talked to Renzo? How do you see Rolles’ debut on UFC? He’s training with Renzo and he’s definitely using it. Renzo has a lot of tips to give. Experience makes difference. If Rolles gets the calm that Renzo won with experience, he can have a promising future on MMA. Rolles gave the black belt to Rashad Evans. Besides he had never trained with gi, he won the black belt of No-Gi Jiu-Jitsu. What do you think about this graduation? Each one gives the belt for a reason, who am I to criticize who’s giving a belt? The guy has to know something about self defense, about Jiu-Jitsu, ground, passing a guard… He can’t only be a tough guy, because he doesn’t represent the top of Jiu-Jitsu. Rashad can use any belt, he’s a born fighter, he trains. Rolles gave it, but in my gym he would have to train with gi .But I don’t contest it.